Would anyone like a dog? My grandmothers neighbors moved out and left her. Shes a German shepherd and shih tzu mix. She is about 4-5 years old. Her name is Dixie. She needs some grooming and a good loving family. She is shy and timid. And wont go to you just yet. Asking a $50 rehoming fee. Message if interested. In waxahachie texas. 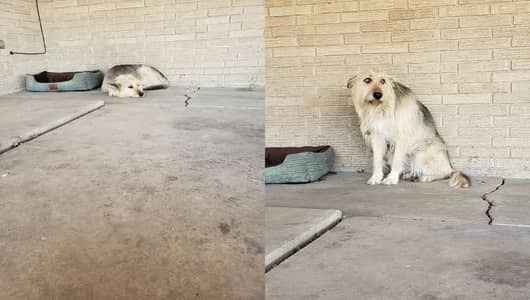 2 Responses to "Pos owner moved and left poor dog with her bed, Dixie still wait at the door day and night"
Is Dixie safe? To just ask $50 for rehoming some will pay that and misuse her. Have a reputable Rescue her, this safer for the dog! OMG!! Has anyone come for her? Hopefully a rescue?? And the people that left her charged?